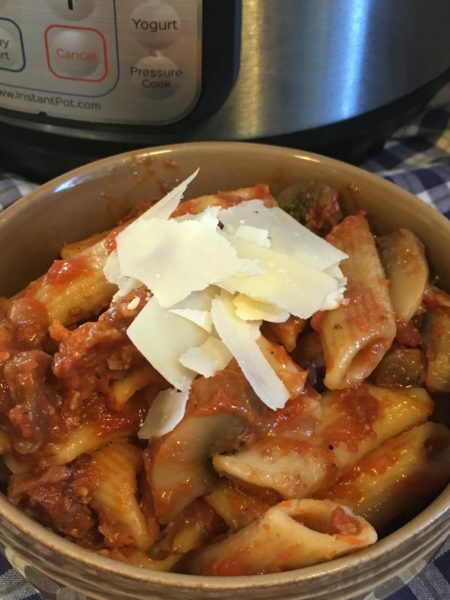 I cooked my simple Instant Pot Pasta dinner (Italian sausage, marinara sauce and penne pasta) for 7-minutes, followed by a quick release. Overcooking pasta releases the starch. That’s why chefs say “al dente” is the perfect stage for pasta. So when you cook noodles, or any other starchy food, they will get mushy… gooey… not-so-great-tasting when they’re overcooked. And because an Instant Pot cooks at a higher temperature it cooks foods faster. Including pasta. Cook fettuccine, spaghetti, linguine or small elbow macaroni for 6 minutes once the steam begins escaping from the cooker. Cook shells, egg noodles, bow pasta or ditalini for 5 minutes; cook alphabets, tubetti or orzo for 3 minutes and rigatoni, ziti, penne, rotini or large elbow macaroni for 7 minutes. How long should pasta cook in the Instant Pot?